On Sunday, Trailer Park Boys returned to Netflix by kicking off their new animated series of the original show. The series begins directly after season 12 of the live-action series. Trailer Park Boys began in 2001 and ran on the network Showcase until 2007. 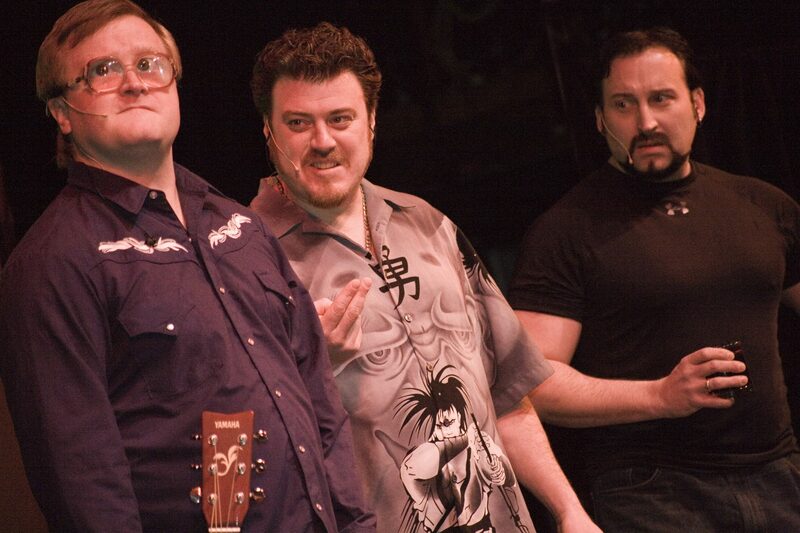 In 2014, Netflix picked up the show again after Robb Wells (Ricky), John Paul Tremblay (Julian) and Mike Smith (Bubbles) acquired the rights to the show from the original producers. Since then, they’ve made five seasons, a third movie and a bunch of Netflix specials. Now the show takes a whole new approach by going animated. At the end of the twelfth season, Ricky, Julian, Bubbles, Mr. Lahey, Randy, Cory and Jacob were left in a jail cell after eating three pounds of mushrooms to hide them from the police before being arrested for their part in an international drug smuggling case. When the mushrooms kicked in, the characters turned into cartoons as part of a massive hallucinogenic trip. For the first couple of episodes, the boys try to figure out how to get back to normal but learn to accept their new reality. The season itself isn’t bad for a direct shift from live-action to animation. What’s different is that instead of one big story going on throughout the season with smaller stories here and there, is that it’s a bunch of random events and storylines. It’s exactly what other animated shows like Family Guy, The Simpsons, Archer and Paradise PD do. The show also manages to bring back a few characters that haven’t been on the show in years, like Steve French the mountain lion and Bubble’s evil puppet Conky. At times, it feels like it goes a little over the top. One example is the episode where the boys go into space to grow marijuana upside down. What made the show funny back in the day was that the boys did really outrageous things in live-action. It gave the show more realism. Overall, this new series is a fresh take on the Trailer Park Boys franchise while still holding the same feeling they’ve kept going for years. It’s got a lot of potential in keeping the series alive and expanding their comedic abilities. With the animation, the boys can go to space, jump over creeks in cars, and get “milked” by hillbillies without having to suffer through stunts or use millions of dollars to shoot it in real life. It’s an interesting approach because while the boys are still the same characters, they’ve reached out and done things they haven’t been able to do before. At times, the Out of the Park specials looked really staged and weren’t really well-received with audiences. IMDB rated them 6.4/10, while the original show holds an 8.4/10. The live shows did even worse with a 5.8/10 for their Dublin special. One of the big questions going into the new season was how the show would deal with the death of John Dunsworth, AKA Mr. Lahey. Dunsworth died in October 2017 after the filming of season 12 and a lot of questions on whether or not the character would be retired popped up. For the new series, the producers decided to keep the character going but using old stock footage from older episodes. [Text Wrapping Break]The producers of the show dealt with Dunsworth departure by having Mr. Lahey kidnapped by a giant “shithawk” and never to be seen again in person. He makes appearances throughout the season as a ghost that comes out of a liquor bottle with Randy being the only one who can see him. Since there is only a limited amount of stock footage of Dunsworth to use, his appearances are short and rare. This isn’t the first Canadian show to go animated after being live action for years. Corner Gas was a sitcom that ran from 2004 to 2009 on CTV. Last year, the show came back animated on CTV and the Comedy Network. Everyone came back to voice their characters except for Janet Wright (Emma Leroy) who died in 2016. What Trailer Park Boys did differently was keep Mr. Lahey in the show with Dunsworth still voicing him, but massively reduced his screen time. Obviously, Dunsworth wouldn’t haven’t been able to record his lines, so they would rely on old stock footage. According to IMDB, multiple actors had auditioned to voice Lahey, but the producers decided to keep his real voice with dubbed over lines and stock footage from other TPB episodes. Some fans believed that the show went animated so that the character of Mr. Lahey would still be around and useable. But from the sounds of it, going animated has been in the works for awhile now. According to Sarah Dunsworth-Nickerson, who plays the character “Sarah” on the show and is the real-life daughter of John Dunsworth, in a Twitter Q&A on Mar. 27 told a fan that he had agreed to do the animated series before he died. Overall, this new series is a fresh take on the Trailer Park Boys franchise while still holding the same feeling they’ve kept going for years. It’s got a lot of potential in keeping the series alive and expanding their comedic abilities. The boys have always been outrageous in their live-action series, but now as cartoons, the possibilities are limitless on what they can do.